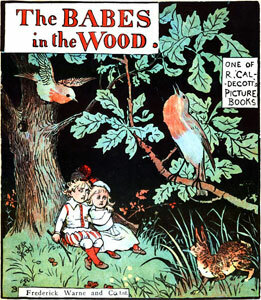 Illustration from The Babes in the Wood [Source: Wikipedia]. Quite why this was such a popular ballad is unclear; it is not the most pleasant subject, depicting as it does the death of two innocent children. It is derived from an earlier play entitled Two Lamentable Tragedies; the One of the Murder of Maister Beech, a Chandler, in Thames-Streete, &c. The Other of a Young Child Murdered in a Wood by Two Ruffians, with the Consent of his Unkle (1601). Folklore has always seemed to occupy a hazy ground on the periphery of modern scholarship, which has only recently begun to be addressed in recent years. A local history society based in Norfolk says that the tale was based on an actual event which occurred in the 1500s. One measurement of health in early modern England is revealed in the statistics of the number of deaths kept by church parishes. From these records historians have gleaned that infant mortality (death during the first year of life) was approximately 140 out of 1000 live births. The average mother had 7-8 live births over 15 years. Unidentifiable fevers, and the following list of diseases, killed perhaps 30% of England’s children before the age of 15 – the bloody flux (dysentery), scarlatina (scarlet fever), whooping cough, influenza, smallpox, and pneumonia. 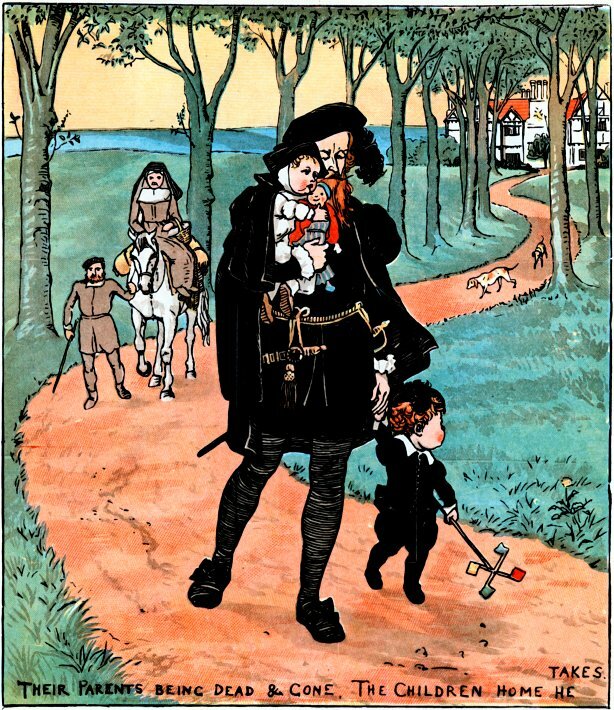 On the Continent, other regions had tales in which a number of children disappeared, or were carried off, for example in the German folk tale The Pied Piper of Hamelin, which is of medieval origin. It is a tale where a mysterious piper, after having rid the town of Hamelin of its rat infestation, carried off its children under a mystical spell. Similarly, modern theorists attribute this folk tale to medieval infant mortality rates. This is not, of course, to say that people in the early modern period, and before, did not care for their children. Testimonies of grief on the part of the parents at a child’s death could be provided to this effect. It is rather to say that they were accustomed, or more used to, the fact that death, particularly amongst children, was a fact of life. 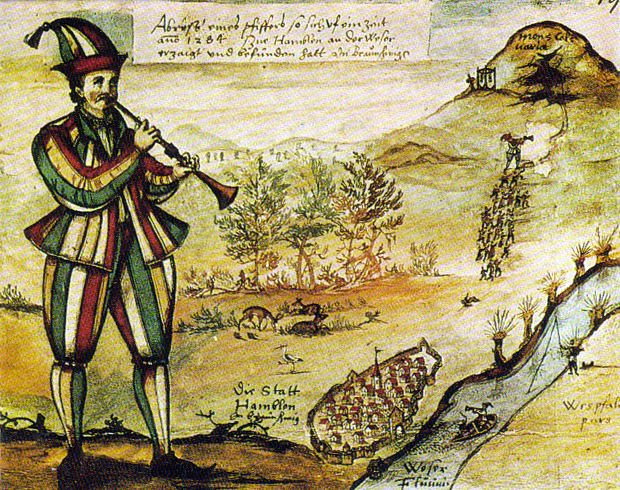 The Oldest Picture of the Pied Piper of Hamelin [Source: Wikipedia]. What, if anything, however, does the story of The Two Children in the Wood have to do with the legend of Robin Hood? Well, during the Victorian period, child mortality rates began to improve (despite what sensational TV history documentaries would have people believe-in their view it’s a wonder anyone survived the 1800s at all!). It was still bad, but the year 1850 especially is marked as a ‘turning point’ by researchers, as the year in which a definite downward trend can be traced. Thos. 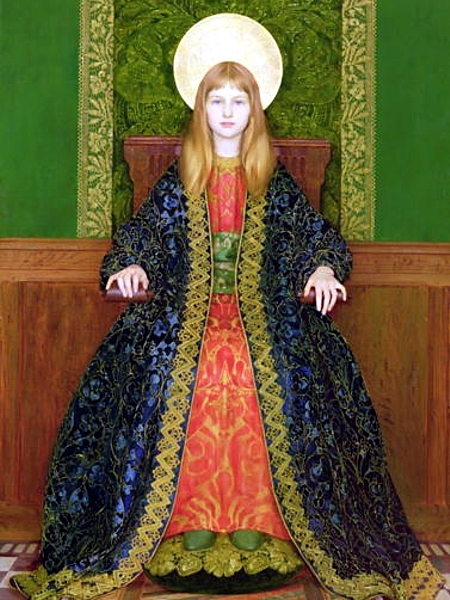 Cooper Gotch, ‘The Child Enthroned’ (1894) [Source: Wikipedia]. In the Victorian period also, the concept of childhood changed. Children, who were depicted in the preceding era often as mini-adults, who, especially if they were of plebeian class, worked as soon as they were able. In the 1800s the child’s status, however, had been elevated, and they were seen as almost angelic, god-like even. The death of children in a popular tale such as The Two Children in the Wood would not have matched Victorian audiences’ sensibilities. Hence the popular nursery rhyme was amalgamated with the Robin Hood legend. A play bearing the title Robin Hood and the Babes in the Wood was first performed at Covent Garden Theatre in 1864. The incorporation of the Robin Hood legend into the narrative of The Babes in the Wood would continue into the twentieth century in pantomime, and still continues to be a popular attraction for Variety Venues to this day. 1920s Advertisement for “Robin Hood, or the Babes in the Wood” at the King’s Theatre in Edinburgh. In the new narrative, the narrator is usually the minstrel of Robin Hood’s outlaw band, Allen-a-Dale, or another member such as Will Scarlet. The children’s evil uncle is cast as the Sheriff of Nottingham. When the children are left alone in the wood, it is usually Maid Marian, or Robin Hood (perhaps standing in for the part of the robin-red-breast bird?) who finds the children and leads them to safety. When Robin Hood is incorporated into the narrative, The Babes in the Wood has a happy ending. Robin Hood reveals the evil machinations of the Sheriff and is taken to task for it. One of the themes which I am exploring in my own PhD research is the way that in the nineteenth century Robin Hood came to symbolise middle-class respectability. The fact that Robin Hood’s story is being “used” to sanitise the grim content of other folk tales and nursery rhymes to me speaks volumes about how “respectable” the popular outlaw hero has become. Joseph Addison, ‘Number Eighty-Five’. The Spectator, June 7th, 1711. Hugh Cunningham, Children and Childhood in Western Society since 1500 (London: Routledge, 2005). Linda Payne ‘Health in England’. Children and Youth in History [Internet] <<http://chnm.gmu.edu/cyh/teaching-modules/166>> [Accessed 20/02/2015]. Thomas Percy, ‘The Children in the Wood’. In Thomas Percy, ed. Reliques of Ancient English Poetry . (London: F. Warne and Co. 1880). D. Wolfers ‘A Plaguey Piper’. The Lancet 285: 7388 (1965), pp.756-757. Robert Woods et al. ‘England’. In Carlo A. Corsini & Pier Paolo Viazzo, eds. The Decline of Infant Mortality in Europe, 1800-1950: Four National Case Studies (Florence: Istituto Degli Innocenti Di Firenze, 1992). I have the book, The Babes in the Wood and The Elegy of the Mad Dog. I am a music teacher and have taught the song ” Poor Babes in the Wood” many times. My Aunt taught it to me fifty years ago. I loved reading about it on your web site.